I have one bit tonight that I do – I’ll mull over what I’m going to do when it’s my turn. But Eric doesn’t even think. Jump on him at any time, say ‘Go!’ and he’ll take you to another level. Then if you say ‘Once more,’ he’ll take you even higher. When you start playing solos and thinking of the architecture of a solo, how to build up and release tension and all these things, you need a basic set of Blues licks to start with. A lick contains a few notes which belong together like words in a sentence and have special meaning or express a certain feeling. In a solo you can use all these licks as a base, combining them and using additional notes. “Steal” what you like, from different musicians or different styles, and put it together playing it in your own way – this is standard in Blues music. It’s good to have a big repertoire of licks for each situation, so that you can instantly start playing and tell the audience what you want to tell. Once again – compare it to learning a language like a kid, starting without thinking of grammar, just learning to combine words so that others understand what you’re meaning. This is quite different than most other guitar styles, where you start with learning a scale and then play ready-made songs from a sheet of paper. A good Blues guitar player doesn’t need to be fast – he needs to know when to play which note like a good storyteller without a book. When I wrote this, I was a beginner myself, back in 1996. In the meanwhile there are lots of tutorial web sites and many videos on youtube about playing a solo. But this tutorial is still valid, complete and free. Use what you like. Just play the root note followed by the interval note above – simply the Blues scale we discussed before in a way to compare root note and interval note. You’ll find “strong” and “weak” intervals you can use for the solo. Then proceed taking the other notes and compare them. This is your basic material. 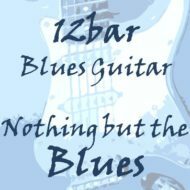 Now build up a “Blues lick starter kit”, using the following licks and taking more from the songs discussed on this site. Scale: A minor pentatonic at the 5th fret. No Mississippi Delta, no Chicago Blues club, nothing. Much better, isn’t it? The beginning of the lick is OK now, but the end is still boring. and the lick is almost complete! Take a closer look: the licks starts ascending with a bend from the note on the G-string into the note with the same pitch of the B-string, and the lick ends with a slide on the B-string into the root note, picked before on the E-string. One of most popular Blues rock licks in history is the intro of Eric Clapton’s Layla. It is a copy, that’s no secret: Duane Allman borrowed it from Albert King’s “As The Years Go Passing By” from his 1967 album Born Under a Bad Sign. It is the verse “There is nothin’ I can do”. As you see there are some differences, but as long as the first and last note are the same, the main theme is similar. The last examples end on a different note and need to be continued, like in the second bar. A good way to learn how to put more feeling into your sound is trying to sound like a voice. Let’s have a look at two examples, nearly identical except the last note. The first lick uses only the minor pentatonic ending with the root note. The vocal for this part could be something like “My baby left me, I cried all night”. We play in the key of E, 12th fret. Below you’ll find some often used Blues licks in various keys. Most of them are discussed on the page for that certain song. Although all pentatonic licks can be played in the I, IV and V position you should find out where to use them by simply analysing which notes are important – see above. Repeating patterns are short runs, which are repeated several times. You can vary speed, sound and volume and use them as a part of your solos.